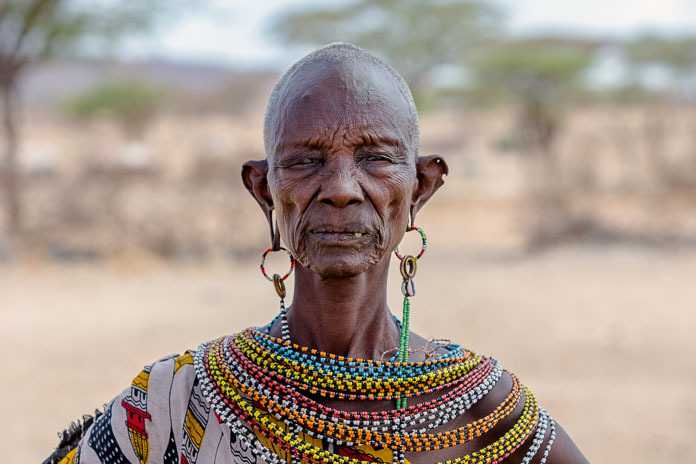 A Samburu woman from northern Kenya. Photo: Susan Portnoy, The Insatiable Traveler. Kenya is best known for the Masai Mara and the millions of wildebeest that crisscross its vast plains during the Great Migration, but this diverse country has so much more to offer travelers who love nature and adventure. 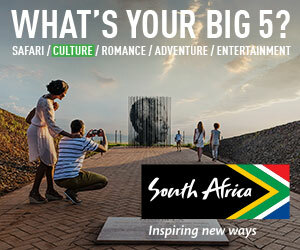 If you’re contemplating a trip, here are four other amazing destinations you might want to add to your itinerary. Northern Frontier, Kenya, Africa. Photo: Susan Portnoy, The Insatiable Traveler. The rugged, mountainous Northern Frontier (which I recently visited as the guest of the Kenya Ministry of Tourism and East African Affairs) encompasses the Samburu, Kalama Laikipia, Shaba, and Lewa regions. It has the visual drama of Namibia with its miles of volcanic rock, desert-like terrain and harsh, though stunning landscapes. Thanks to fewer travelers in the north, you rarely (if ever) share sightings with other vehicles. 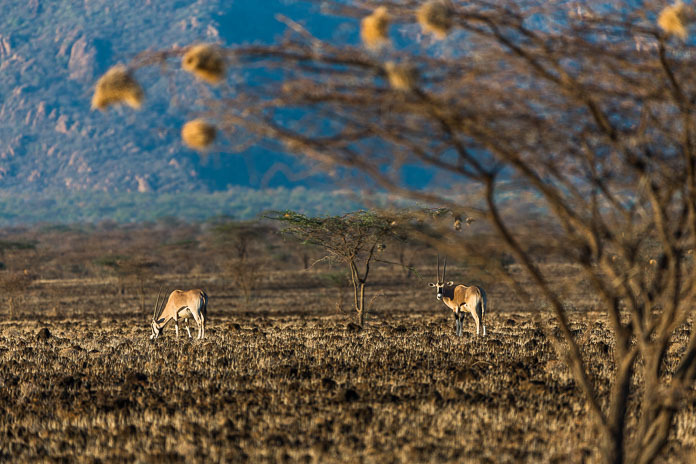 Animals are a bit shyer than those used to the constant attention in the Mara, but for many this “wilder” north is a refreshing change from areas where game has become so accustomed to humans they’re almost indifferent. Landscape and wildlife aren’t the only reasons to venture to the Northern Frontier. Dan Saperstein of Hippo Creek Safaris, one of Wendy’s Trusted Travel Experts for Africa, sends many of his guests northward. And he explains that the cultural experiences are different there as well. “The Samburu, Borana, and even Laikipia Maasai, who are all quite distinct from the Maasai found in the south and in Tanzania, have different artwork and customs.” You can arrange for visits to local homes called Manyattas, and according to Saperstein, they’re often less commercial than in the Maasai villages in the south. 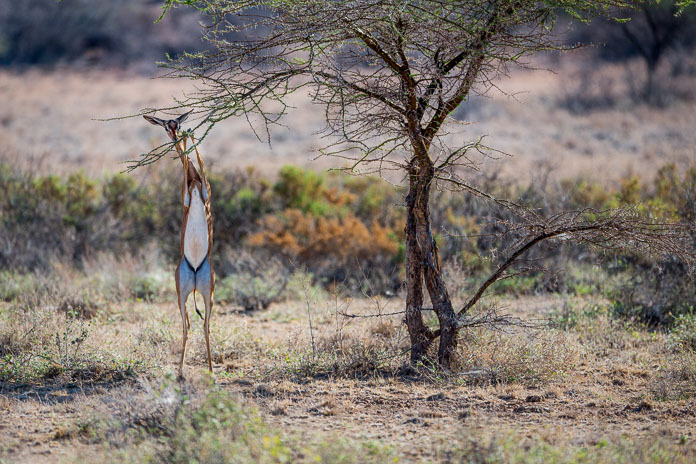 Only found in northern Kenya, the gerenuk is Somali for “giraffe-necked antelope. Photo: Susan Portnoy, The Insatiable Traveler. Imagine the glimmer of a shallow blue lake at sunrise dotted by thousands of fluffy pink flamingos. 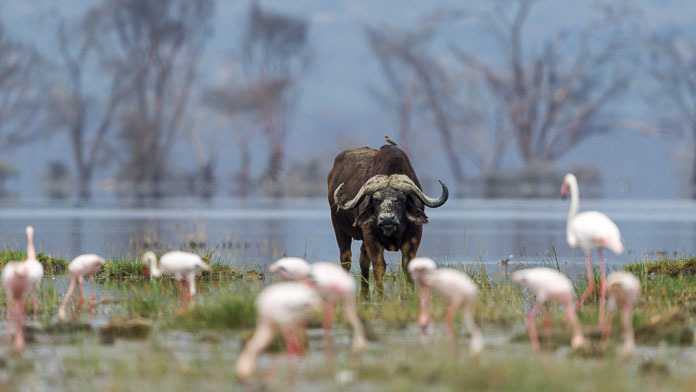 The algae that grows in the warm waters of the Rift Valley’s Lake Nakuru, is a delicacy for the pastel flocks and other species such as pelicans and cormorants. 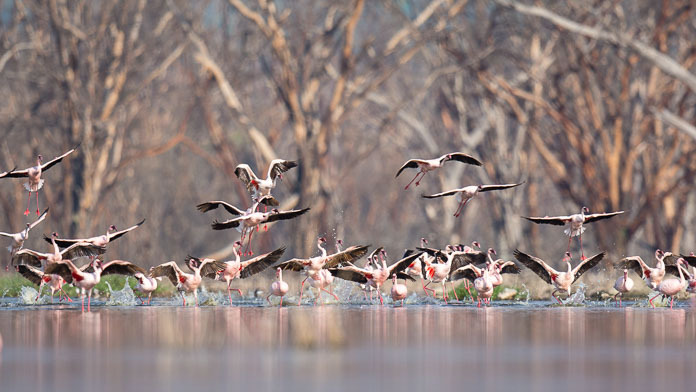 Van der Walt has seen large numbers of flamingos at the lake year round, but for the best viewing he recommends trips in April through June after they breed in Tanzania and migrate north to Kenya. 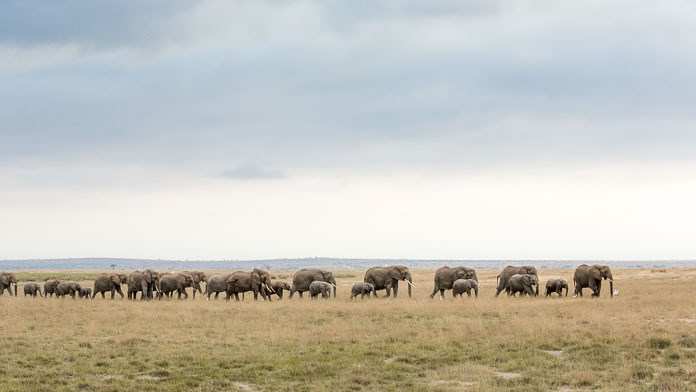 Elephants traverse the plains of Amboseli. Photo: Susan Portnoy, The Insatiable Traveler. Elephant lovers, take note. Amboseli National Park near the Tanzania border draws huge herds of elephants that can number 80 members or more for your viewing pleasure. Underground springs, fed by the melting snow off Mount Kilimanjaro, attract elephants and many species of birds to the resulting swamps. They provide cool mud and life-giving water during the dry season, which runs between June and October. 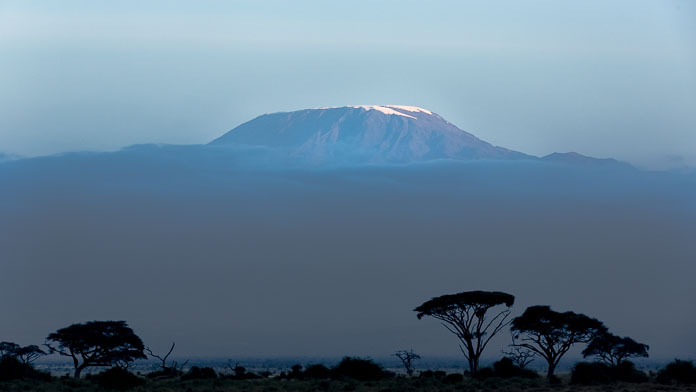 The summit of Kilimanjaro in Tanzania as seen from Amboseli, Kenya. Photo: Susan Portnoy, The Insatiable Traveler. While the elephants are the stars of the park, there’s plenty of other wildlife, and if you’re lucky, weather permitting, you may even get to see the Kili summit peeking through the clouds. 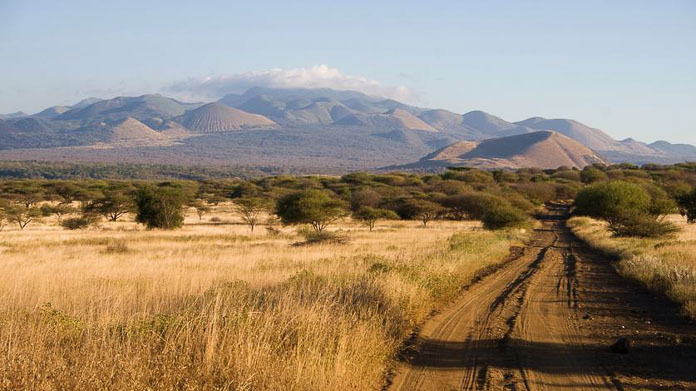 Southeast of Amboseli is Tsavo West, another Friedman favorite. It first became famous in the late 1800s for the two, man-eating lions that killed a number of construction workers building the Kenya–Uganda railway. Today, without the threat to life and limb, travelers who love to immerse themselves in nature will find plenty to enjoy on game drives and guided walking safaris. You’ll want to check out the Nile crocodiles and large pods of hippos that frequent Mzima Springs, a crystal clear stream that flows into three large pools connected by rapids. In the top pool, a glass viewing room provides visitors with a fascinating look at the water and its inhabitants below. 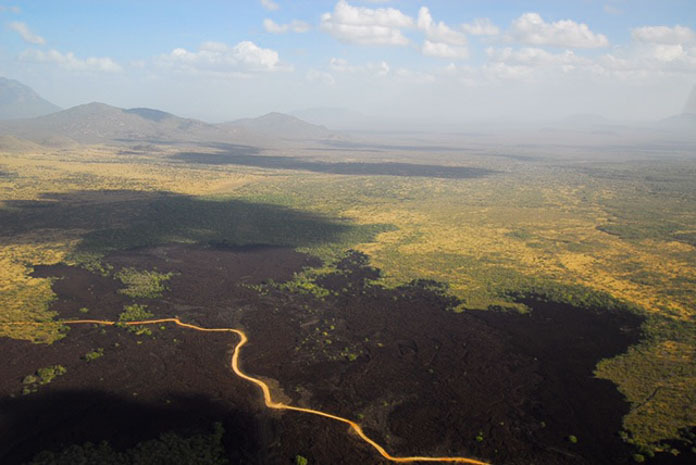 The Shetani (meaning devil) lava flow is an undulating black landscape that spans nearly five miles. It’s a marvel of spectacular jagged rocks and caves to explore along the road to Amboseli, and another must-see. A wonderful blog post from Susan Portnoy, so informative … and those photographs! Yes, inspiring.